This is an incisive, often amusing account of a WW2 Landing Craft Tank (LCT) Squadron comprising around 50 LCTs and LCIs (Landing Craft Infantry), written by its Commanding Officer shortly after the end of the war. The story starts in the harsh, cold, winter of 1943/44 in the Moray Firth on the north east coast of Scotland and ends with the hazardous landings on the Normandy beaches on D-Day, June 6, 1944. 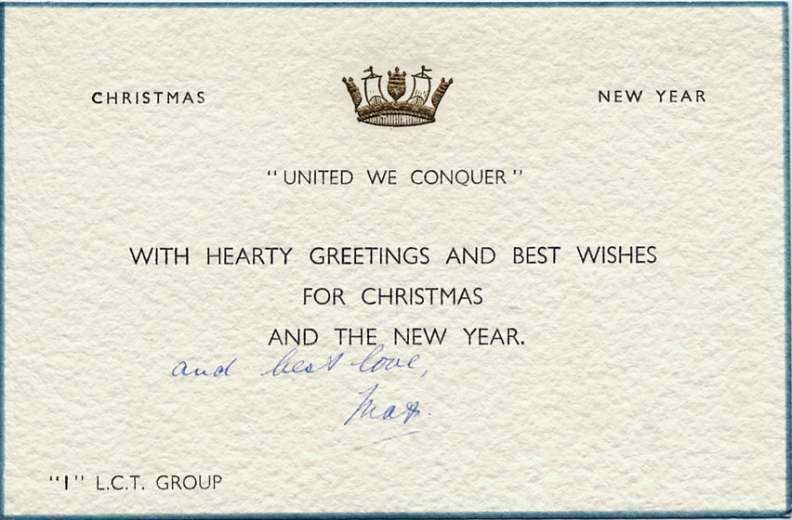 It's told by the late Lieutenant Commander of the squadron, Maxwell O W Miller, RN, later Commander. Elie Halévy, that great French historian of the British people, says somewhere, that the most inexplicable thing about the British Navy is that its greatness has been built up against a background of ill-used sailors, in ill-found ships, commanded by the most undisciplined corps of officers that ever stepped a quarterdeck. In the recent war, it was my good fortune to serve in Major Landing Craft, the Tank and Infantry Landing Craft that bore the brunt of the landings in France and Italy, and to command a squadron that would have delighted Monsieur Halévy’s historian’s heart! I was a bit shaken, in the March of 1943, when I found myself appointed in command of a squadron of Tank Landing Craft. I was still more shaken when I saw my first vessel. It is usual for the sailor to tell the enquiring landlubber that the sharp end of a ship is the ‘bow’ and the blunt end the ‘stern’, but in the Tank Landing Craft, or LCT, you had to reverse your ideas. The stern drew in to a very narrow counter and the bow broadened out to allow for a door, hinged at the bottom edge, that lowered down onto the beach and was wide enough to allow a large tank – of which the craft carried seven – to waddle out onto the beach. When I had cleared up that rather important point, I tried to take one to sea and very quickly found it wise to discover some other urgent business that forced me, reluctantly(! ), to hand her over to her proper captain. There were other peculiarities. In an ordinary ship, the propellers are large and do from thirty to one hundred and fifty revolutions a minute; moreover, if there are two of them, they turn in opposite directions to make for ease of handling. In an LCT, the propellers were small, turned at seven fifty to twelve hundred revolutions a minute and they both turned the same way! This was to help the manufacturers but it considerably complicated the job of the captain. If you add to this the facts that the craft was of very shallow draught and flat-bottomed so that she had very little hold on the water and sailed in a wind like a yacht and that her rudder was so small that it had no effect at all unless the propellers were turning and turning fast, it will be easy to see that taking a landing craft out of a congested harbour was no job for an orthodox naval officer. Fortunately, command of individual craft during the war was the exclusive preserve of the Royal Naval Volunteer Reserve (RNVR) and, as a very experienced salvage officer once said to me, ‘The first thing I do when I get to a wreck is to send for a ship commanded by an RNVR. You can tell them to do anything you like and they don’t know enough to know that it’s impossible, so they go ahead and do it!’ And, by Jove, if they did not do it, they were in for trouble. In the late autumn of ’43, the Admiralty started to form the three forces for the invasion of Normandy and I went to Inverness at the beginning of December to take over command of a squadron of LCT that had begun to form there. 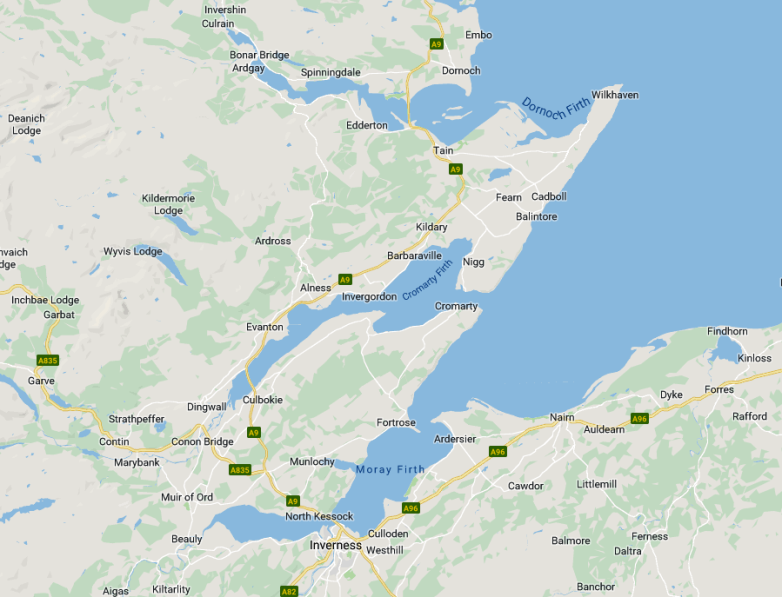 I arrived in a thick fog and drove over icebound roads to Kessock, a suburb of Inverness and there I installed my staff and myself in a group of uncompleted council houses (houses built for the less well off by the local tax payer). I suppose shells of council houses would be a more accurate description, because there were no window frames and fireplaces. This rather made a mockery, during that bitter winter, of the traditional staff luxury, in which we were accused of indulging by the crews of my LCTs moored out on the water. In the Beauly Firth, a trot of buoys had been laid where the LCTs, about fifty of them, moored up in pairs with the bows of one pair touching the stern of the next, and whenever I had any time and energy left over from obtaining stores and fuel, organising repairs and attending planning conferences, I used to take them to sea to practise manoeuvres and station-keeping. On Christmas Eve, having about a dozen craft available, I boarded the nearest one and, slipping at about six pm, led them out to the Moray Firth for a night’s exercises. 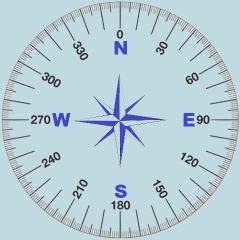 It was not a very wise move, as the rising wind and the falling glass (barometer) should have warned me of the North-Easter and it made me turn back at midnight. However, it blew us home through the Inverness Firth and at about 2am we arrived at the Kessock Narrows on a full ebb tide. We had a maximum speed of some seven knots, so it took us the best part of an hour to clear the Narrows against a five and a half knot stream and then we found ourselves in Beauly Firth with the buoys somewhere away on our port bow. The night was pitch black, we were not allowed to show any lights, there was nearly a full gale blowing and a three knot tide running down the trot that had half-submerged the buoys. My own job was easy. All I had to do was to flash a signal down the line ‘Secure in your previous berths’, and then sit back and watch the fun, or rather, listen for the crashes, because I could not see a thing. They all got there, of course. They always did. 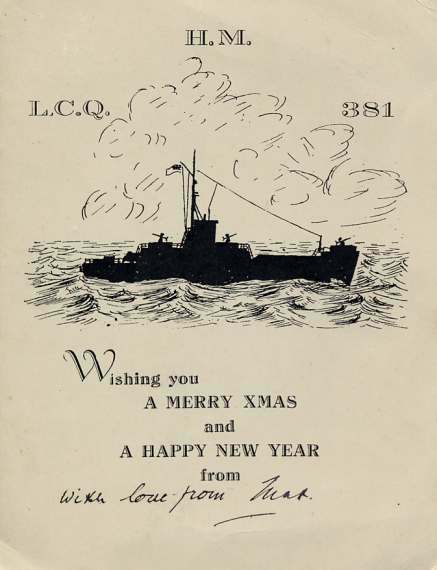 My own captain had three shots at picking up his head buoy and took the best part of two hours over it, so next day, as a Christmas present, I relieved him of his command on the grounds of inefficiency. A year before, he had been the proprietor of a pub in the Old Kent Road in London and, six months later on D-day, he won a decoration having been killed on Gold Beach, so perhaps he was not so inefficient after all. God knows I would not like to run an East End pub but the Commanding Officers set such a high standard of accomplishment for themselves that to relieve him of his command seemed the normal thing to do at the time. He was a strange chap. The first time I went onto his bridge I looked down on top of his head and the next time, I found him looking down on mine. It made me blink, until I noticed that he was wearing boots with three-inch high sloping heels and flat embroidered toes. I was rather worried about those high heels until I went down to his cabin for tea and found shelf after shelf of Wild West literature and realised that he was wearing Mexican cowboy boots. I have often wondered how an educated man with a romantic passion for the Wild West came to be running a pub in the East End of London. I suppose it was no stranger than the fate that took him to his death on a Normandy beach in command of a self-propelled barge. 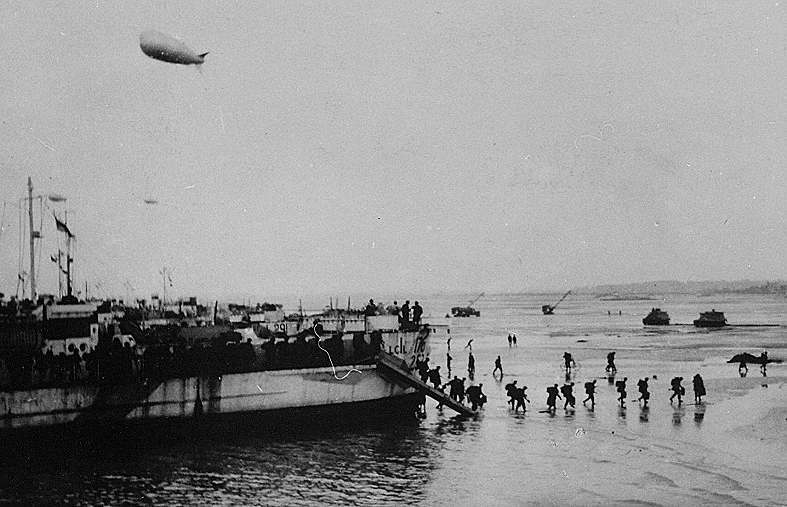 The crew of a Tank Landing Craft consisted of two officers and twelve men. Of these, a nucleus of ten per cent were supposed to be regular naval ratings from the Fleet but the Fleet, unhappily, was not disposed to send its best ratings to landing craft and we found that our nucleus consisted mostly of what are known in the navy as ‘birds’ or offenders. Since we were usually without them anyway, while they worked off their latest detention sentences, we eventually dispensed with them officially as well and placed our reliance in the ‘hostilities only’ ratings. These were new recruits but I have to say that we never regretted our decision. They came to us straight from the egg or, rather, straight from the New Entry Training Establishments and after a fortnight’s training in Combined Operations, they were drafted to a craft as part of the ship’s company. It was an important part too. When you have only five working hands on the upper deck, every one of them has to pull with two hands for the King and the man who kept one hand for himself was not much use to us. The first thing they had to do was to learn to live in a landing craft at all. An LCT was 190 feet long and, at its widest part, 30 feet wide. The forward 120 feet was the tank hold and abaft that was her engine room, which left space for a mess deck 30 feet long. It narrowed from some 25 feet wide forward to four feet wide right aft. But the crew did not get all that to themselves by any means. The galley was taken out of it on the port side, the rudder head stuck up amidships with a rather Heath Robinson rig running through the mess deck to the steering wheel in the conning tower. An electric capstan engine with a shaft through to the upper deck was positioned right aft. Near the capstan, a ladder came down from the quarterdeck and down the hatch with it came the wind and the rain. You had to have the wind and the rain, because if you closed the hatch, you did not get any air. In the middle of that jigsaw puzzle, the crew ate and slept and spent what leisure time they had. As a matter of fact, with the sailor’s aptitude for homemaking, they usually looked fairly comfortable, except in weather that was so cold that, air or no air, the hatch had to be closed. As soon as this was done, the moisture began to condense and, in a few minutes, the deck was running with water and drops fell from the deck head like rain. 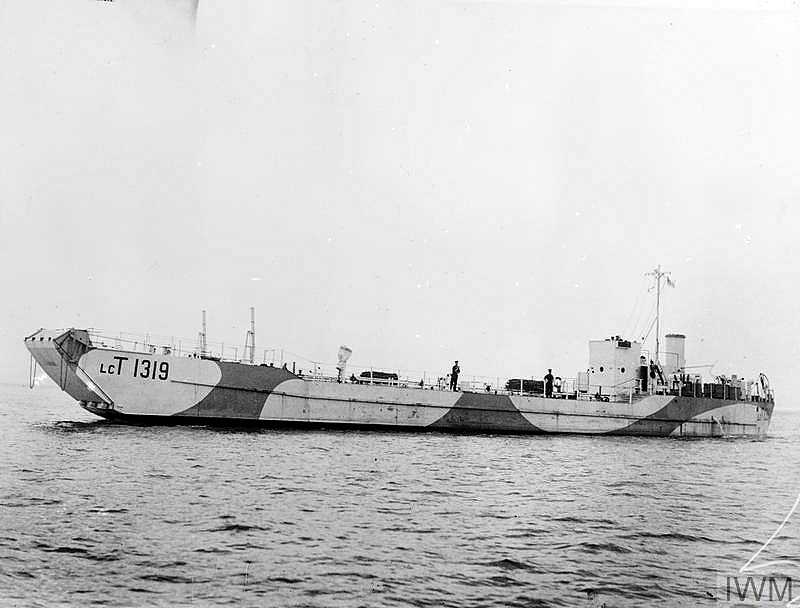 During that bitter winter at Inverness, this became such a menace to the health and comfort of the crew that stronger and stronger representations eventually persuaded the Admiralty to authorise the installation of coal-burning stoves on landing craft mess decks. I can still remember months after D-day the pleasure with which I read in Fleet Orders that these stoves were now available and would be supplied on demand. However, as the order reached me when I was sweltering in more than a hundred degrees of moist heat in Southern India en route for Japan, I had to discourage my stores officer’s enthusiasm for demanding stoves, as he said, ‘just to teach the Admiralty a lesson’. It was nobody’s fault that the craft were so uncomfortable. It had never been the intention that they should be lived in. They had originally been designed to work from shore bases in the south of England and to be manned just long enough to enable them to run across the Channel, dump their loads and come back again. In between times, the crews were supposed to live ashore, only going on board their craft while they were actually on exercises. This was all very well as long as the number of craft in service was small and they could be confined to a few bases where there was shore accommodation available. Unhappily for the crews, the numbers increased so rapidly, and the craft became so popular with any local senior officer who had a job to be done and wanted a handy craft, that they were very soon working all around the coasts of Great Britain and everyone forgot that they were not intended to be lived in. Of course, the Admiralty appreciated the situation and took steps to meet it but they were not entirely free agents. 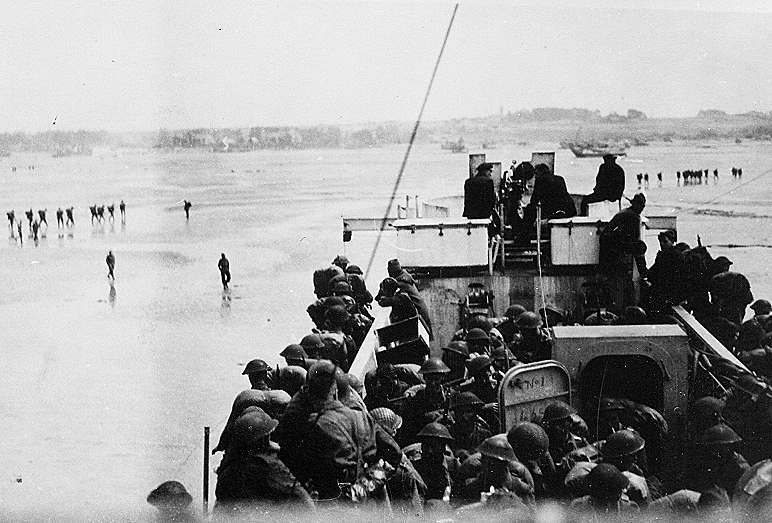 The object of the LCT was not to provide a comfortable home for sailors but to land the soldiery and their vehicles on the shallow beaches of Northern France in a fit condition to fight the Germans immediately on landing. When it turned out that Jack would have to live on board, very little could be done for him except at the expense of giving the poor pongo (soldier) a deeper and wetter wade ashore under the enemy’s fire. That the poor pongo could not be asked to do this was made only too agonisingly clear at the attack on Dieppe, when the LCT Mark III beached so far out that very few vehicles ever managed to struggle ashore. As a result of the Dieppe tragedy, the Mark IV LCT was designed and, although the Navy had several other names for her, all of them unprintable, it is scarcely too much to say that, if it had not been for the Mark IV LCT, the Allies would not have been in Berlin yet. Unhappily, it was the very qualities that made her such an ideal landing craft for the army that led to her dislike by the Navy. The essential thing, of course, was that she should carry the same load as her predecessors on a shallower draught and the only way to do this was to increase her beam and make her scantlings (beams/struts) lighter. The increased beam and shallower draught made her practically unmanageable in a wind and the lighter scantlings made her waggle. That waggle was the most extraordinary thing that I have ever seen in a ship. The craft was built rather on the lines of an oil tanker. The bridges and superstructure were right aft and the tank hold stretched away forward with a narrow catwalk, about 5 feet wide, running either side as far as the forecastle, which rose a few feet to make room for the heavy winches that raised and lowered the tank door. The result was that the hold formed a sort of beam with heavy weights at either end and the rigidity of the craft depended on the strength of the beam. In the Mark IV LCT, the beam was pretty weak, and when you steamed into a head sea, the fo’c’sle waggled at you. There was no other word for it. You could stand on the bridge and watch a ripple start at the after end of the catwalk and move forward until the whole fo’c’sle waggled. It was a most terrifying sight to anyone unfamiliar with ships and still more terrifying to someone who was familiar with them. Of course, if you drove a craft into a head sea too hard or for too long, something had to give. What did give was the catwalk. Luckily, at the after end of the hold, there was a watertight bulkhead that stretched the whole breadth and depth of the craft because, when the catwalk split, the bows were inclined to drop off! However, it took more than a little contretemps like that to disturb the equanimity of the RNVR. After all, as far as the crew was concerned, they were still left with a watertight bit of ship, complete with engines, propellers and rudders, and all they had to do was shore up the bulkhead and steam home, towing their bows astern of them if the weather permitted. Brought up in Harry Tate’s Navy, as they had been, the crews used to view this proceeding as just one of those things that happened at sea but the Army complained bitterly about it. Quite rightly, too, since it was their end of the ship that used to drop off. Naturally, everything was done to counter this tendency and we spent many hours ploughing into head seas, while the ‘boffins’ alternated between bouts of seasickness and hurried glances at their stress meters in their attempts to find the weakest parts of the ship, so that they could be strengthened by welding on a doubling plate. Not that that did much good. It was too much like putting a patch on a worn out pair of trousers. Every time one weak spot was patched, a split occurred somewhere else and, on the whole, we preferred our old familiar waggle to the shrugs and shudders that resulted from the ‘boffins’ well meant attempts to help us. You did at least know how much of your ship was likely to part-company with you. When these Mark IVs first came into service, there was considerable anxiety about them on the part of officers responsible for sending them to sea and I received the wigging of a lifetime for taking a flotilla of them as far afield as Colonsay, in the Firth of Lorne. However, time and the seamanship of the RNVR worked their cure. I thought of that wigging two years later when I had fifty of the craft with me in the middle of the Bay of Bengal, with seven hundred miles to go to Malaya and the Monsoon blowing. However that's another story. After a winter of hard work in the stormy seas of the Moray Firth, the craft were all badly in need of repairs and facilities for docking them were practically non-existent. As the craft were flat-bottomed and meant to be beached, we waited until the top of spring tides and then ran them up on the beach and allowed them to dry out. This enabled us to work on them for a few hours each tide but the procedure had its disadvantages. In the first place, whenever the water was less than the required depth, all machinery had to be stopped owing to lack of cooling water. This, of course, meant no lights and no heat, and no lights and no heat in a steel box on the Northeast coast of Scotland in March has to be experienced to be believed. However, it did have one good effect. It made the ships’ companies work like blazes to get their craft finished and, lights or no lights, twenty four hour shifts were the rule rather than the exception. The fact that the only suitable beaches always seemed to be miles away from the nearest pub also helped to make the crews stir their stumps, and the two together enabled us to have some fifty craft more or less dry docked but adequately refitted and ready for sea in a fortnight, and that without any outside assistance. When we had finished training the Army and ourselves at Inverness, we set out for our battle stations in the south of England. It sounds fairly easy when it is put like that but it was not as simple as it sounds. The passage south was an adventure from the word ‘go’. We sailed in two long columns with twenty five craft in each column and me in the Admiral’s yacht in the lead. With the craft only a hundred and fifty yards apart, this still made the columns two miles long if everybody kept in perfect station but our diesel motors were not designed for station keeping and a northerly gale blowing against a lee tide off Rattray Head during the early part of the first night did nothing to help. Fortunately, I turned back at daylight to see that my flock were all still in company and to chase up the laggards. I had hardly got back into station at the head of the line when we ran into fog. The normal and seamanlike thing to do if you run into fog in coastal waters is to anchor but we were certainly not normal and we always had to invent our seamanship as we went along. For one thing, very few of the craft had wireless and those that did could only get them to work spasmodically. So it was no use trying to give them orders in a fog and, anyway, their anchors, which were let go from the stern on a wire, were totally incapable of holding them in deep water in the heavy swell bequeathed to us by the previous night’s gale. It was very definitely a case of ‘better to go forward and die’. So I put my trust in The Lord and the commonsense of the Commanding Officers and pressed on. As usual, neither failed me. When the fog cleared shortly after we had nosed out way past May Island in the Firth of Forth, there they all were, not in perfect station admittedly, but still in company. I never thought I would be so pleased to see them. That first experience of fog was a godsend in its way because, whatever the experts may say about January and June being the fog months for the North Sea, I can assure them that there was plenty of fog on the east coast of England during that April of 1944. In fact, we hardly spent a day at sea without visibility closing down to zero at some period of the day and it was only the confidence bred in us by that first day’s experience that enabled us to reach Newhaven on the date laid down and even then, we only just managed it. We left Harwich on the last leg of our voyage early in the afternoon and wended our way through the mine-swept channels with strict orders to enter the Downs at 7 o’clock the following evening, as there was another convoy due to follow us through at 7.30. That suited us down to the ground, as it would just enable us to navigate the tricky channel in daylight and go through the Straits of Dover in the dark. We were determined not to be late, as our route took us on a wide curve with a right-angled turn into the Downs and we were very anxious to complete this turn in daylight, since our long lines of slow and unwieldy craft stood a good chance of losing touch in the spring tides that would be sweeping across the point of turn. However, the fates willed otherwise and we had just started our turn when the other convoy hove in sight, coming out of the mouth of the Thames. The copybook says that it is when gentlefolk meet that compliments are exchanged but I must admit that I had the gravest doubts about the ancestry of the commander of the other convoy when our exchange of compliments showed him to be the senior and he ordered me to stop engines and let him pass ahead of me. I was left with two miles of unwieldy ships stretched out in a half-completed turn, the darkness gathering and only shaded signal lamps handled by inexperienced young signalmen to get them under way again for the entry into one of the trickiest channels round the English coast. The first thing he ran into was a German air raid returning from bombing London and obviously they were delighted to fire off their guns at anything they saw on the way home. That must have shown him up to a wandering E-boat, which took a smack at him as he rounded the South Foreland and then he ran into a bombardment from the long rage batteries at Boulogne. Having got their teeth into him the Huns were obviously loath to let him go and as he passed out of range of the big guns, the E-boats were at him once again. What was left of the night was fairly peaceful but the enemy had one more shot in their locker for him and they sent out their minelayers and laid a minefield in his path. Luckily, the mine layers had been seen and the convoy was ordered to turn back and anchor. He turned back along his course and as he was about to anchor, he ran into us and the fog closed in. I was rather worried about it at the time, as I knew that after his adventurous night, my strange and ungainly craft blundering past his ships in the fog would look pretty hostile to frayed nerves and that trigger-happy fingers would fire first and apologise a long time afterwards. However, we passed through him without incident and turned up, short of the minefield, to Newhaven after a most exhilarating night. It had been just what we needed too. After two or three years of training on the West Coast of Scotland, our crews had almost forgotten the existence of the enemy and that night of vicarious excitement had put them on their toes again and made them realise that there really was an enemy, that when he fired at you, men did get killed and ships did sink. Your best chance of survival was to keep awake and get your blow in first. The crews were delighted to arrive at Newhaven. Many of them lived in the south of England and the prospect of electric trains every few minutes to take them to the bright lights of London, promised to make up to everybody for the lonely months spent in the more inaccessible parts of Scotland. However, the Security Services knew a trick worth two of that and forbade all movement, except on duty, outside a radius of five miles form the harbour. Not that the sailors took that one lying down. You could hardly expect them to with the trains leaving every few minutes from their very doorsteps. How many visited London it would be difficult to estimate but we stopped it in the end by persuading the London Patrols to meet all trains when they arrived at Victoria. I must confess that I felt a bit of a cad about that, because the real offence was to leave the environs of the port and I always felt that, if they managed to do that, I ought to let them spend a few hours with their friends before the patrol picked them up and brought them back for punishment. However, the certainty of being picked up as they got off the train at Victoria had the desired effect and we settled down fairly quietly to sweat it out, as our Americans friends called it, and wait for the great day. There was a strange, unreal quality about those April days of waiting. I have never seen so much blossom as there seemed to be on the trees as we sped through those quiet Sussex lanes on our way to and from our Portsmouth conferences during that lovely spring. It seemed that reality was in those English lanes and that the desperate enterprise on which we were so shortly to embark was a nightmare tucked away at the back of our minds, that would never have to be dreamed. It was not until the blossom fell from the trees that we realised that the nightmare was reality and the apple blossom a doubtful dream of next year’s spring. As those long May days drew to a close, the atmosphere became more and more tense. Senior officers sped backwards and forwards between Portsmouth and Newhaven as plans were modified, cancelled, reintroduced and altered again. Every day some crank turned up with a bright idea that had to be examined and tested, accepted or refused, as we strove to make success more certain and to minimise the casualties we expected to suffer. The wildest rumours circulated among the crews and their most gruesome forebodings appeared to have been justified, when a sudden influx of officers and men into the local holding barracks proved to be almost one hundred casualty replacements for the squadron. Nominated officer for officer and crew for crew, we had to set to and train the men, who were to step into our shoes. 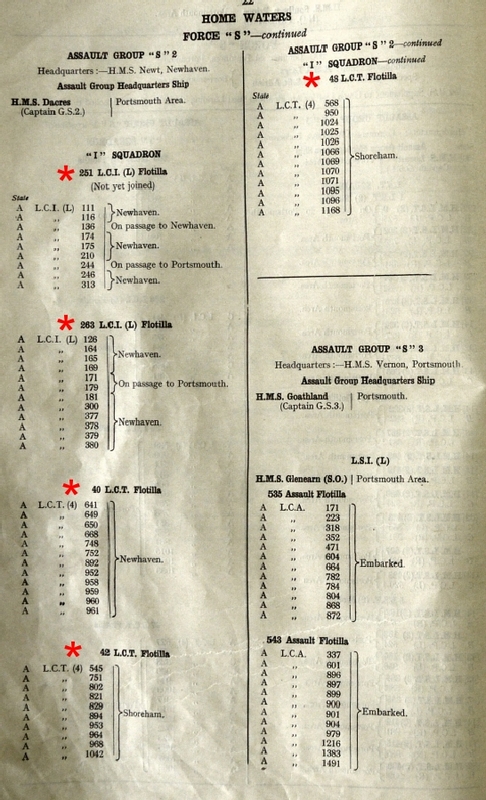 On the day our successors arrived, we sent two ammunition craft to Portsmouth to load and they came back a few days later loaded down to their gunwales with high explosive and the prospect ahead of them of running up on the French beaches at the height of the battle and waiting for the tide to leave them high and dry before they could start unloading. For sheer, cold-blooded courage, the coolness with which those two crews faced their future was hard to beat, their only complaint, and it was an official one dressed up in all the panoply of the King’s Regulations, being that their captains had forbidden them to smoke on board their craft. This had offended their sense of justice for some unfathomable reason, but I was able to comfort them by pointing out that, while the rest of us were busy day and night training our replacements, they were able to idle away their time as no replacements had been detailed for them. By some strange quirk of their unimaginative English minds, they decided to accept this as a good omen and I forbore to disillusion them. But it added considerably to the macabre atmosphere of those last few days! With the coming of June, the pace quickened and, as conference followed conference and briefing followed briefing, it was obvious that we would soon be off. At last, the day came when the craft were ordered onto the hards to embark their action loads and when the loads arrived we very nearly ordered the crafts off the hards again. 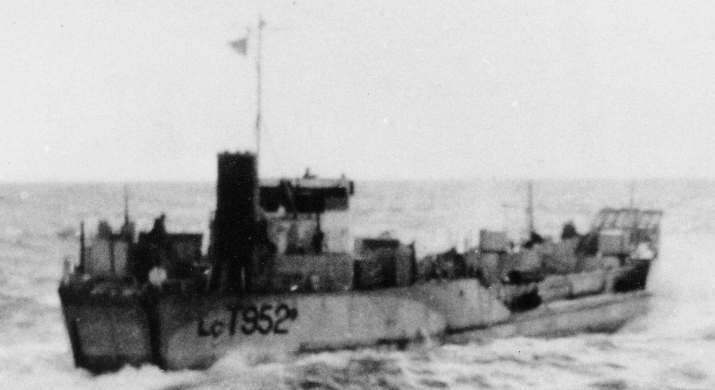 The loading of an LCT was a matter of considerable importance, as her draught and the slope of her keel depended on it. These, in turn, affected the height up the beach at which she would take the ground. To maintain the draught and trim, the loads for each craft had been worked out very carefully indeed, even to the extent of chalking out the holds to show, within inches, where each tank or lorry was to be fitted in. Unfortunately, to the sailor, in their simplicity, a tank going out to battle in France was a tank stripped for action, whereas, to the soldier, his tank going out to battle in France was his future home in a strange and hostile land for an indefinite period of time and, as such, every bit as much a transport for his household goods as it was a fighting machine. To make matters worse, the Colonel’s household goods were usually considerably heavier than the Subaltern’s and, since his tank was normally stowed right forward so as to land first, this put our extremely tender craft down by the bows. It took a lot of explaining and many frayed tempers before we finally persuaded the colonels that this really was the worst thing that could happen to them and not some quaint nautical whimsy invented for the annoyance of the simple soldiery. Happily, the Battle of the Baggage occupied our minds to the exclusion of more morbid thoughts but the tenacity with which it was fought boded ill for the unfortunate Germans, who were about to pit their strength against the disgruntled losers. Heartened by this victory, my squadron took the twenty four hour postponement of D-day in its stride. It was just one of those things that happened at sea and no worse than many of the other obstacles that we had surmounted in our career. The officers settled down to rook their passengers at poker and Jack sucked his teeth, hitched up his trousers and hoisted in another day’s provisions, which was exactly what he expected to go on doing every day he remained in the Navy. On the following day, the local betting was against our sailing but this was probably because our wishful army passengers viewed the southwest gale with jaundiced eyes. The Navy was divided between a desire to show off their sea legs and a more genuine anxiety that our bows might waggle themselves off during our long beat to windward to join the traffic lanes to Normandy. The signal to sail reached us at noon and half-an-hour later we were under way, the spray flying from our fo’c’sles as we turned to the westward and dug our bows into the sea. For the Normandy invasion and the ‘build-up’ after it, an American flotilla was attached to my squadron and the difference between the Americans and the British was a perpetual delight. In passing, it might be worth saying that the American Flotilla Officer, Willard Eyres (sic Lieutenant Commander Willard Wood Ayres)(1), was one of the finest men it has ever been my privilege to meet and, taking their cue from him, his craft were the cleanest and best disciplined in my squadron. The relations between the Americans and the British can be seen when I say that, at their request, it was my practice always to berth an American and a British craft together, so that the British could get the advantage of the superior American rations and the Americans the advantage of the British wine stocks, their own ships being dry by Act of Congress. It was at sea that the difference between the two nationalities became apparent at once. To illustrate this I leave the chronological timeline for a few paragraphs. I remember one night, about ten days after the initial Normandy landing, taking down a convoy of eighteen Infantry Landing Craft, nine American and Nine British, to Gold Beach, off Arromanches. The sea was flat calm but it was slightly foggy and we were cruising at nine knots with me leading the British column and Willard Eyres (sic Lieutenant Commander Willard Wood Ayres) the American one. He was about a cable away on my starboard beam. 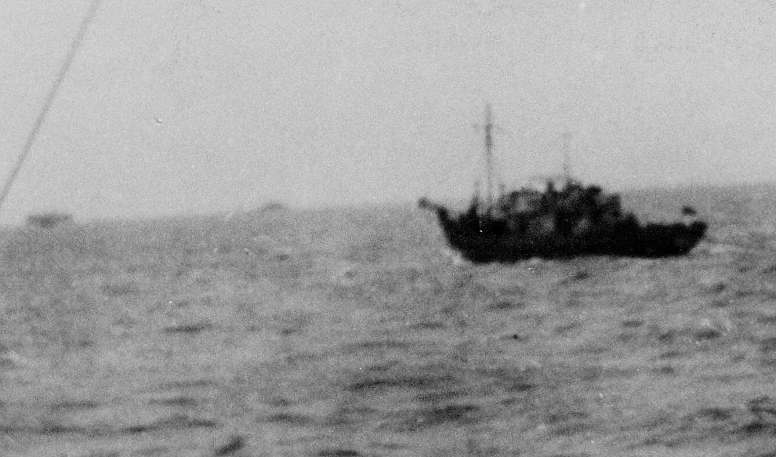 Visibility was down to a couple of hundred yards and, as we approached Piccadilly Circus, the point where the swept channels from the beaches all converged and then spread out again to the Home ports, we sighted a convoy of large merchant ships almost right ahead and nearly on top of us. There was no time to signal and I altered course to starboard to avoid. A moment later, to my horror, I saw a grey shape just ahead of me and I immediately went to starboard again to clear the oncoming convoy’s escorting corvette, her light grey almost invisible against the darkening fog. This put me straight through the American line and I quickly realised that they must have had some trouble of their own, for, on either bow I saw an American craft moving ahead at a converging angle. It was obvious that the three of us were going to meet at a point. I put my engines full astern and sounded U’s (the sea’s danger signal) on my foghorn but they could not have been heard and the two Americans collided bow to bow and disappeared into the darkness. I went ahead and cast round to look for survivors but, finding nothing, I presumed that the craft had got away with it. Having completely lost my convoy in the mêlée, I resumed my course for Arromanches. As visibility increased with the dawn, I searched the sea for my craft and to my surprise; there on my starboard beam were my Americans. How they had managed to keep in touch I never found out, but there they were, all nine of them, two of them showing signs of their recent collision, but all in perfect station on myself and on each other. There was not a British ship in sight. I was due to beach at 6.30am and only just had time to make it but I reduced speed for a while to give the British craft a chance to catch up. Then, as no one else had appeared, I increased to full speed and made for the beach, arriving half-an-hour late. I need not have worried about the British ships. They were all there on the beach, having arrived at 6.30 as ordered. Each captain had come separately and by his own route, of course. There was not a captain among them who did not think, indeed know, that he knew better than I did how to get there. Every one of them had instinctively seized on the excuse afforded him by the mêlée at Piccadilly Circus to branch off onto his own pet route. And they had not done too badly either. One of them had brought down a Junkers 88 during the night and another had survived a brush with enemy E-boats. I secured a decoration for the aircraft gentleman later on but the E-boat fighter was a little bit over the odds. The position of his scrap was some twelve miles off any possible route to Gold Beach and on the wrong side of an enemy minefield, so I had to take his word for the compass error that had led him there. 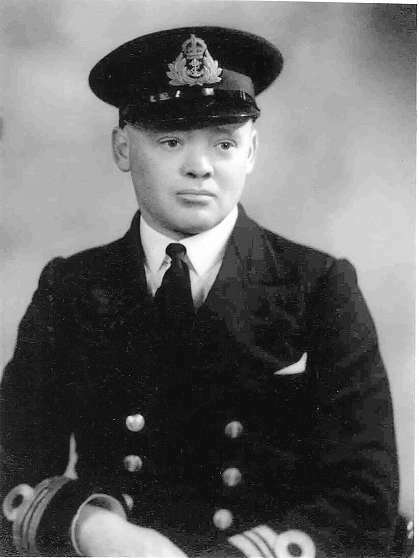 He had a young brother in Coastal Forces at our base in Newhaven who had probably told him the E-boats’ favourite stamping grounds and I strongly suspect that the error had crept into his compass only when he got out of my sight at Piccadilly Circus. I called them to order of course. When I got back to Newhaven, I took them all back with me the same day to Normandy as a punishment. It was a Saturday and it meant that they would spend the weekend at sea instead of beating up Brighton with their American friends. But I knew it would not do any good. Thank God. You cannot knock out, in a few months, an instinct for self-confidence to the point of lawlessness that is as old as the British Navy. 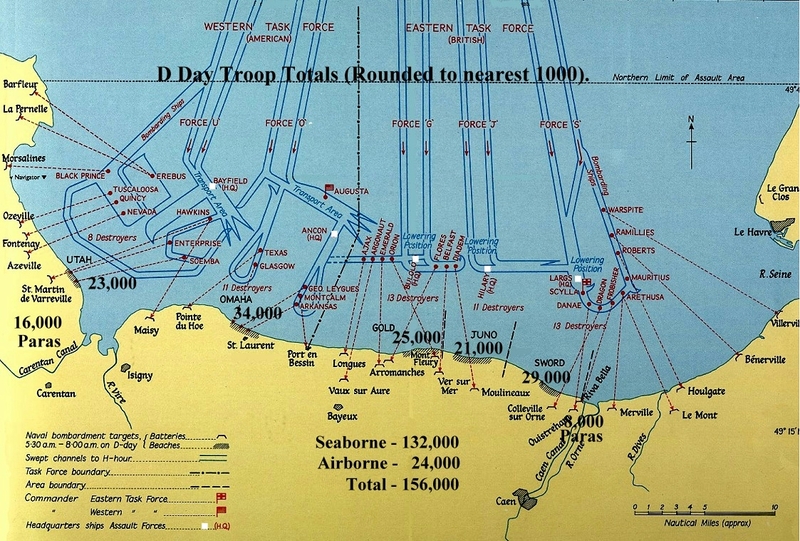 Returning to the timeline, we carried the Intermediate Brigade designed to land ninety minutes after the first touchdown and affect the initial breakout from the beaches. In the vanguard were twelve Infantry Landing Craft, carrying between them three battalions of infantry, who were to advance from the beaches in the tanks that would follow them ashore from the twelve LCTs. Bringing up the rear of the convoy were no less than twenty four landing craft full of vehicles plus, of course, the baggage we had thrown off the tanks. The rising sea played havoc with our station-keeping and every few hours I had to break off from the head of the line and round up the laggards. Our timetable was far too rigid and congestion in the swept channels was going to be far too great to permit any straggling. At one o’clock in the morning, we sighted the motor launch that marked the entrance to our lane down to the beaches and turned round her to the southward. Peering anxiously into the darkness, we tried to pick up the dim blue and white buoy-lights that marked the edges of the swept channel. Every now and then, a lookout reported a black shape to port as the convoys carrying the infantry for the initial assault slipped past us in the fast ship channel. For some strange psychological reason the lookout always whispered his report and we all whispered on the bridge too that night. Except that is for one brief, blasphemous moment when my navigator reported that our only chart of the beaches had blown over the side. When we had recovered from that crisis and decided that we could beach from memory, we unconsciously resumed our whispering, but apart from that, so preoccupied were we with our navigation that the landing in the morning completely passed from our minds and we were even momentarily puzzled to account for the noise of the preliminary bombardment when it suddenly lit up the southern horizon. When dawn broke, we could see a mass of ships ahead of us and hoped that somewhere among them was the buoy which marked the Lowering Point and from which we were to start our accurately timed run to the beach. I was faintly surprised by the number of ships about and rather disappointed that none of them was sunk or sinking. It seemed rather an anti-climax after our fears of the last few months. It was rather a nuisance too because, somehow or other, I had to thread my convoy through them before I could start my run for the beach. Occasionally, a spout of water would shoot up but it looked so clean and harmless that it was difficult to realise that it was caused by a heavy shell from the batteries at Le Havre. Six miles away to the southward, we could just make out the brown outline of the coast and the rising smoke and constant gun flashes might have worried us if we had not been far too busy trying to find a way through that mass of ships. Like a rugby three-quarter looking for a gap in the defence, I scanned the ships ahead of me for an opening for my craft and eventually swerved for the touchline of the field when I was clear. With twenty minutes in hand before we were due to start for the line, I stopped the convoy near the Lowering Pont and turned the tank and vehicle convoys over to their respective senior officers, keeping control of the infantry craft myself. As our zero hour approached, we edged towards the buoy and got away to a flying start with six miles to go and some intricate manoeuvres to do on the way in. 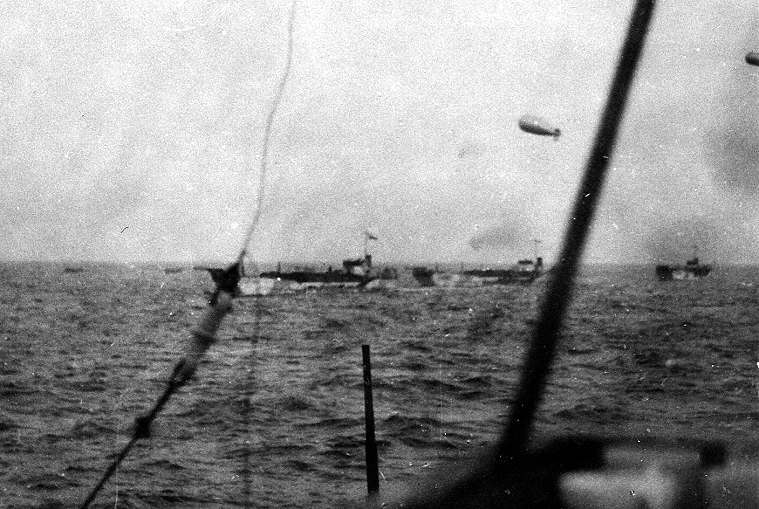 For traversing the narrow swept channels, the whole convoy had come over in two long columns and, to even up the lines, I had had to station four of my infantry craft in my own column and eight in the starboard one and from there we had to get into our beaching formation of line abreast. This was considered too exposed a formation for the six-mile run in and our orders were to shake out into three columns about halfway in and into our line abreast in the last half-mile of our run for the beach. That was the theory anyway and, during rehearsals, we had become pretty good at it. So many degrees alteration of course, so much increase of speed and we were in three columns. Repeat the dose and we were in line abreast. 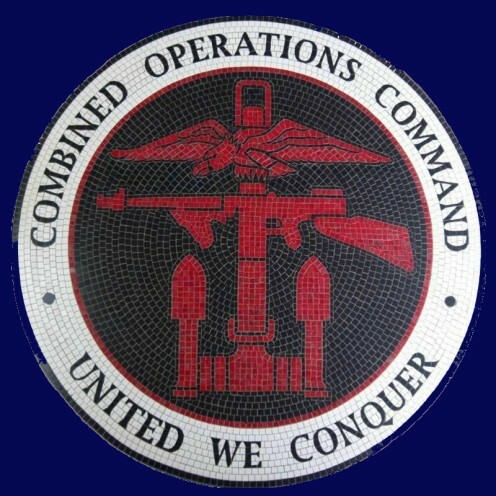 But, of course, it did not work out like that in practice and I thanked God that I had commanding officers, whose natural inclination was to think for themselves and who enjoyed doing what they were told about as much as a saint likes sin. We started off in fine form, in perfect station, a fine array of signals flying for our first manoeuvre and plenty of speed in hand to carry it out. Unfortunately, in our rehearsals we had never had a couple of destroyers come dashing across our bows at the last moment, at full speed, with all guns firing and the shells from an enemy battery falling all round them, nor had we encountered wrecked and burning landing craft in our path, which oddly enough, flatly ignored the rule of the road and most inconsiderately continued to occupy the very water we needed to perform our tricks. It was pretty obvious that ‘tricks’ were off and, negating my manoeuvre signals, I hoisted the ‘Prepare to beach’, hoping that all would be well. I need not have worried. The captains had seen the trouble and, before my signal was halfway up the mast, they were threading their way between the obstacles into their three columns and, as we neared the beach, they came up into line abreast without more ado. Moreover, when it became obvious that the left-hand beaches were so cluttered up with burning craft that beaching there was impossible, they foresaw my swerve to starboard and when father turned, they all turned. It was as well they did, because we were doing fourteen knots and less than thirty feet apart, so that the slightest failure of nerve or nous on the part of one would have meant a most unholy crash for all. It was a manoeuvre that warmed the cockles of my heart and the next moment we were in among the mines and struggling to find a patch of bare sand on which to beach. Fortunately, the mines were land mines tied to the top of underwater stakes and too small to stop a 300-ton landing craft but they were a nuisance to the soldiers cooped up in the troop spaces down below who got the full benefit of their blast. My own craft, luckily, escaped and, after dodging a few sunken tanks, we ground our way through the wreck of an assault craft onto the beach. As soon as we were stopped, I went up on the fo’c’sle to see if we were high enough up the beach for the army to wade ashore and, on my way back to the bridge, I gave permission for landing to start. To my surprise, I passed half-a-dozen soldiers lying on the deck, kicking and struggling. I could not make out what was happening for a moment and then I suddenly realised that the men had been wounded. I must admit that it gave me the shock of my life. It was the first time that morning that I realised that we were being fired at. The shelling we had passed through on the way in had seemed an obstacle to navigation rather than a danger to life, and while on the fo’c’sle, I had idly watched explosions on the beaches, some within a hundred feet or so, but I had been so interested in what I was doing that it had never occurred to me that the shells were meant for us and that they were lethal. I was rather sorry I had woken up and nipped up the bridge ladders for my tin hat quicker than a dose of salts through a cormorant. I was glad to have it on too when I got there, because the rising tide had brought the landing craft up the beach into range of a line of villas on the seafront and the snipers inside them had opened up on us. We hated it but stood it as long as we could, because the confused fighting ashore was milling round the houses and we were afraid of hitting our own men. Eventually, someone lost his temper and opened up and, within seconds, 36 Oerlikons, 3 from each craft, had joined in and the line of villas folded up like a house of cards. I was afraid that, having tasted blood, my crew might be difficult to drag away. I could see the tank landing craft coming up astern and knew it was time to be off, so I hoisted the signal to withdraw before we became further involved in the fighting. Being the leeward craft, I had to un-beach first myself, and as soon as my bows were off the beach, I could see that we were in for trouble. To keep our sterns up while we were on the beach, we had all let go our stern anchors, an excellent practice on an English beach but an error of judgment with sunken tanks and craft cluttering up the bottom of the sea and fouling our anchors. Worse still, some of the anchors had caught up in the mine-topped stakes and when the craft tried to weigh, they hauled their sterns onto the mines. For a few minutes, we were a solid, milling mass as, afraid to heave them in, we drifted down to the full scope of our stern wires. Then, fortunately, someone saw the answer and produced an axe and we all hacked ourselves free. Clear of the beach, I took stock of the damage and found, to my relief, that only three craft needed help and their friends already had them in tow. I collected their wounded from them and despatched the lot back to Newhaven. After taking the casualties to a destroyer, I returned to the beach to watch the remainder of my squadron disembark their loads. They were an inspiring sight as they went in to beach but I had to check their obvious intention to hang about and join in the fun after they had emptied their holds. There was work to do and plenty of it, bringing reinforcements from Home and this was no time for fun and games. Sending the sound craft on ahead, I rounded up the crocks and started on the slow journey home. We were a sorry convoy. Two of the craft had their quarterdecks awash, one of the tank craft had had her door blown off and was being towed stern first and, in true landing craft fashion, the stern of one craft was towing her own bows home. I steamed slowly round them and as I watched the crews laughing and talking on deck, Monsieur Halévy’s words came back to my mind. 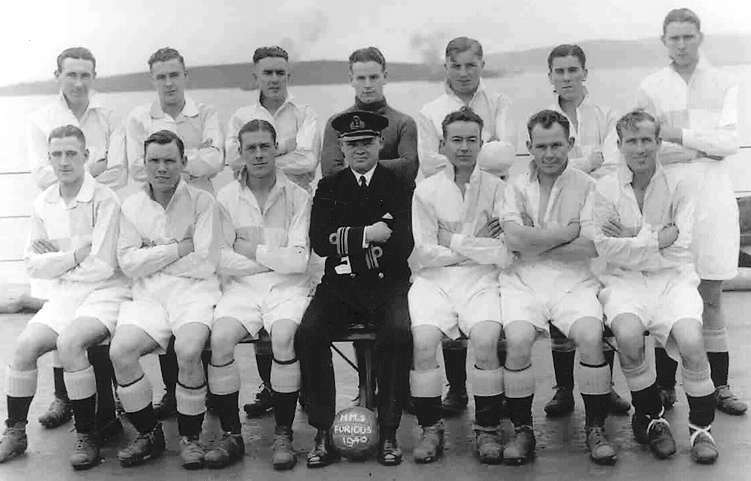 Those sailors may have been ill-used, their craft may have been ill-found, those officers may have been undisciplined, but, by God, they still knew how to do their stuff! Commander Miller was taken ill at sea in 1956 and passed away in hospital in Rangoon. We are very grateful to the son of Commander Miller, Mr Robin Miller for making available his father's recollections and photographs for publication on this website and to Tony Chapman, Archivist and Historian of the LST and Landing Craft Association, for acting as intermediary in this process. Thanks also to Tony for his well informed comments on the photographs.